Depending on the model, you will see an increase in fuel capacity by up to 62 percent. * Actual volume and operational time will vary by machine model. A horizontally mounted tension cylinder opens up room between the carriage and track for easier cleanout. The undercarriage is sloped on both sides of the tracks to shed material, such as sand, dirt, mud and debris, better than the previous design. In addition, raised cutouts between the rollers allow for easier cleaning. Dual-flange front idlers now ride on the rubber track’s roller way. These new front idlers, along with wider rollers, help reduce vibration to improve operator comfort and reduce track wear to help extend the track life. Single-flange idlers are still found on the rear of the machine to help minimize de-tracking. The optional Roller Suspension system has also been changed to optimize ride and operational characteristics. This system also incorporates the dual-flange front idlers, wider rollers, along with mono-leaf springs, for smoother action. The front idlers have been relocated to enhance machine operation. Clearance at the rear of the machine has been increased. 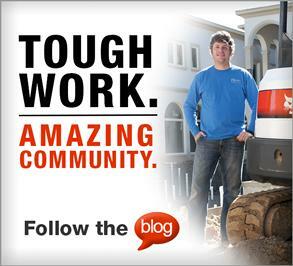 This allows machines to travel over curbs and other obstacles with less chance of catching on them. 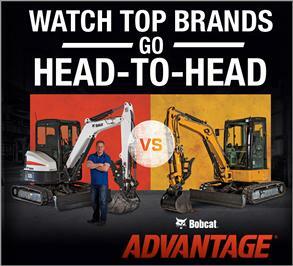 Narrow and wide tracks for compact track loaders are interchangeable at your local Bobcat dealership. 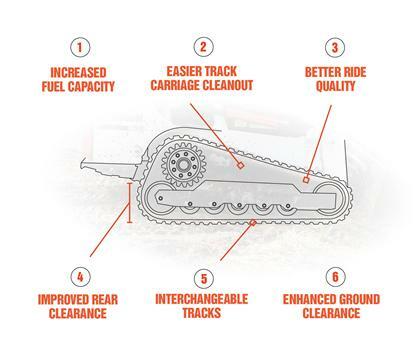 Ground clearance at the center of the undercarriage has been improved by up to 27 percent, helping you travel through mud, sand and other soft soil conditions more easily. *Certain specification(s) are based on engineering calculations and are not actual measurements. Specification(s) are provided for comparison purposes only and are subject to change without notice. 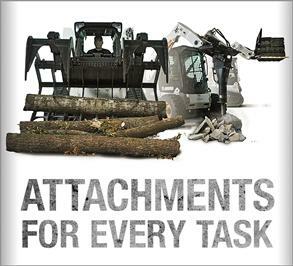 Specification(s) for your individual Bobcat equipment will vary based on normal variations in design, manufacturing, operating conditions and other factors.